One of the leading museums in Athens, the Museum of Cycladic Art is dedicated to the study and promotion of ancient cultures of the Aegean and Cyprus, with special emphasis on Cycladic Art of the 3rd millennium BC. It was founded in 1986, to house the collection of Nicholas and Dolly Goulandris. Since then it has grown to accommodate new acquisitions, obtained either through direct purchases or through donations by important collectors and institutions. 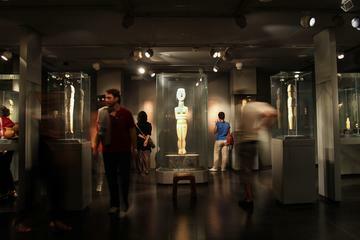 The Museum of Cycladic Art, Athens. The Stathatos Mansion. The Museum of Cycladic Art. Cycladic Art 3200 - 2000 BC Cycladic culture flourished on the islands of the central Aegean during the Early Bronze Age (3rd millennium BC). The MCA collection is one of the most comprehensive collections of Cycladic antiquities worldwide, comprising an astonishing variety of marble figurines and vessels, bronze tools and weapons, as well as pottery from all phases of the Early Cycladic period. The birth of Greek art in the proto-historic Aegean, the development of Classical culture and its gradual dissemination all over the Mediterranean basin constitutes one of the most influential phenomena in the history of western civilization. The MCA holds a large collection of Ancient Greek Art with representative artifacts from all periods between the Middle Bronze Age (2nd millennium BC) to the very end of the Roman period (4th c. AD). The Cypriot collection in the MCA (Th.N. Zintilis collection) is one of the most comprehensive collections of Cypriot antiquities in the world. It contains more than 800 objects that help visitors learn about the history of the island and its relations with other regions of the eastern Mediterranean from the 4th millennium BC to the Early Christian period (6th c. AD). The 4th floor houses the ancient Greek art collection of K. Politis and the permanent exhibition “Scenes of everyday life in ancient times”, where the visitor has the opportunity to get an idea about the public and private life in ancient Athens by means of special films and three-dimensional virtual reality presentations, associated with the 142 objects belonging to the permanent collections of the museum. On the basement of the building at 4, Neophytou Douka Street one can purchase replicas of some of the museum exhibits. In 1992 a new wing was added to the Museum, at the Stathatos Mansion. 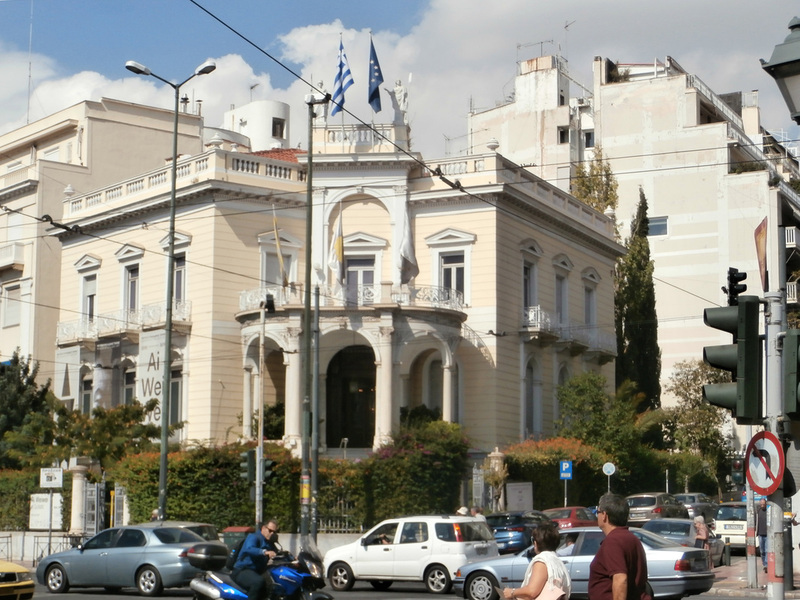 A remarkable neoclassical mansion Stathatos Mansion was designed by Ernst Ziller in 1885. In the New Wing you can see the Academy of Athens collection of ancient Greek art. Temporary exhibitions constitute one of the most fruitful activities of the MCA, constantly renewing the museum's interaction with the public. The numerous archaeological exhibitions are meant to introduce the public to important aspects of ancient Greek art as well as of other Mediterranean cultures, with loans from other Greek and foreign museums. ​​In the vicinity of the Museum of Cycladic Art, the Athens Key recommends Periscope hotel, a boutique city-hotel offering minimally decorated rooms and suites with state-of-the-art facilities. Each comes with free WiFi, a flat-screen TV, CD and DVD library, and pillow menu. The modern bathrooms are stocked with luxurious toiletries, bathrobes and slippers. Complimentary fruits, snacks, and beverages can be enjoyed all day in the lounge. The exhibition “DIVINE DIALOGUES. Cy Twombly and Greek antiquity” showcasing ancient artworks in a unique dialogue with contemporary works by contemporary American artist Cy Twombly inspired by Greece and Greek mythology took place at the Museum of Cycladic Art from May 25th to September 3rd at the time when Athens co-hosted the Documenta 14. Among the exhibits is the François Vase, also known as the Kleitias Krater, a milestone in the development of ancient Greek pottery and vase painting, displayed here for the first time outside of the Archaeological Museum of Florence. It has been said that the François Vase is so unique that, even if all other ancient Greek vases were lost, it alone could illustrate Greek mythology and the code of ancient Greek art. In 2016 the Museum of Cycladic Art celebrated 30 years of creative presence with an exhibition entitled “Cycladic Society 5,000 Years Ago”. Since no written documents of the Early Cycladic period survive, this exhibition attempted to “read” in a simple and straightforward manner the social structure, activities, living environment, and, where possible, convictions and beliefs of the Cycladic islanders in the Early Bronze Age (3,200-2,000 BC) through their creations. The exhibition was organized by the Museum of Cycladic Art in collaboration with the Ephorate of Antiquities of Cyclades and it housed 191 ancient artefacts: from its own collections, the Ephorate of Antiquities of Cyclades (98 artefacts came from the Museums of Naxos, Apeiranthos, Syros and Paros) as well as the National Archaeological Museum and the Paul and Alexandra Canellopoulos Museum. Cycladic figurines, in their present form, with their simple shape and clean outline, became popular through their association with abstract art by 20th-century artists like Modigliani, Brancusi, Matisse, and Picasso. Viewed primarily as works of art, they were often presented in a strictly typological manner, without reference to their creators’ cultural sphere. The exhibition “Cycladic Society 5,000 Years Ago” aimed to fill that void and explore the daily life and undertakings of the Cycladic islanders 5,000 ago! Acclaimed American photographer Robert McCabe first arrived in Greece in the 1950s. The shots he took of Greece during that time provide an opportunity to assess the past and consider the future. “When I first set foot in the Aegean in 1954 I found villages that had no electricity, running water, telecommunications or cars, while in many cases the only connection to the mainland by sea was with caiques,” says McCabe. “People lived in perfect harmony with the natural environment and were very conscious of resource management." The Museum of Cycladic Art in Athens included McCabe’s photographs in its “Cycladic Society 5,000 Years Ago” exhibition which opened in early December. His section of the exhibition was titled “Memories and Monuments of the Aegean” and comprised two sections. The first depicted aspects of life in the Aegean in the 1950s and 60s, before the arrival of technology. The 40 images in this section covered four themes: celebrations, women’s occupations, men’s occupations and work at sea. The second section featured 33 photographs of seaside archaeological sites. The majority were taken in 1954-55, when these sites were little changed in regard to the descriptions provided by foreign travelers in the 19th century. Most of these spots are historically significant, some as sites of worship, others as commercial centers and others still for their strategic importance. "Divina Proportione" 2012, wood, by Ai Weiwei at the Museum of Cycladic Art. "Grapes", 2011, wood, by Ai Weiwei at the Museum of Cycladic Art. ​The Museum of Cycladic Art (MCA) in Athens presented a major exhibition with renowned Chinese artist and activist Ai Weiwei. Ai Weiwei at Cycladic was the artist’s first exhibition within an archaeological museum and in the country of Greece. This exhibition introduced audiences to his practice through many of his significant works, placing them within the museum's world-famous collection. 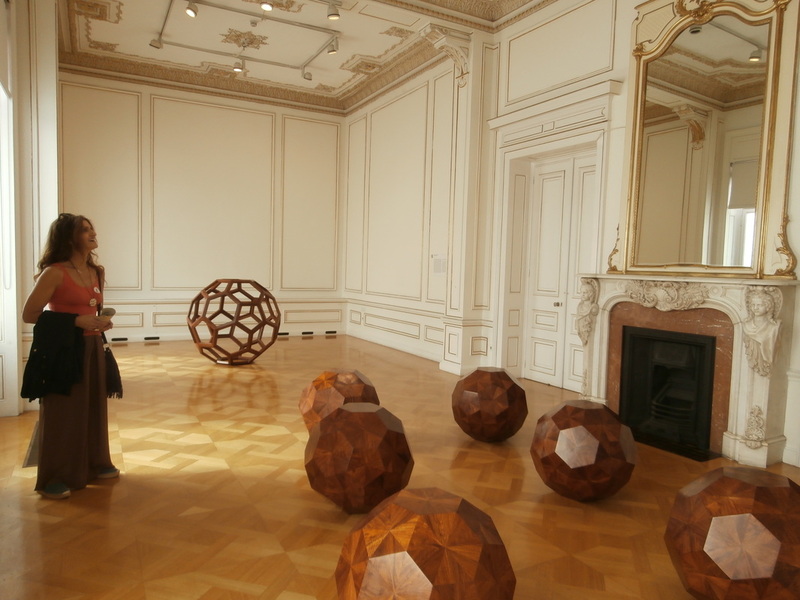 Ai Weiwei also unveiled new works creating a dialogue with the permanent archaeological collection of the museum. The exhibition explored the artist’s use of materials often associated with antiquity such as marble, as well as the craftsmanship and traditional techniques of wood. The 25 artworks on display also included celebrated works Grapes, Divina Proportione, Mask, Cao. "Standing Figure", 2016 by Ai Weiwei at the Cycladic Museum. "Surveillance Camera", 2015, by Ai Weiwei at the Cycladic Museum. "Chandelier", 2015, by Ai Weiwei at the Cycladic Museum. "Mask", 2011, by Ai Weiwei at the Cycladic Museum. How did ancient Greeks care for their nutrition and bodies? How did they address the issue of public health? What would an athlete do if he got injured 2.500 years ago? Were there any surgical tools? How did they use opium and other pharmaceutical substances and herbs? From the dawn of its existence, humanity has strived to improve all aspects of living conditions. Achieving and maintaining good health, seeking to understand the causes of diseases and, mainly, searching for solutions to fight and treat illnesses have been a primary concern and interest throughout all periods of civilization. The Museum of Cycladic Art presented the major archaeological exhibition Hygieia: Health, Illness and Treatment from Homer to Galen, focusing on the universal subject of Health, providing an overview of the evolution of ancient medical practices: the transition from magico-religious healing practices to rational, scientific medicine. The exhibition presented approximately 300 artifacts with the participation of 41 international museums. Our earliest literary sources for the history of Greek medicine are the epic works of Homer which reveal that the Greeks of the Heroic Age linked sickness and disease with the supernatural, regarding them as manifestations of the wrath of the gods. To appease the gods, they employed prayers, purifications, animal sacrifices etc. Even the idea of health (Hygieia) was personified as a wonderful goddess usually accompanied by a snake, the symbol of therapy. By the late 6th century BC, however, philosophy came to exercise a powerful influence upon the development of medicine. Hippocrates and the classical Greeks were the first to evolve rational systems of medicine free from magical and religious elements, realizing that maintaining good health and fighting disease depend on natural causes. The exhibition presented three main subjects and covered the era from 1200 B.C. to the 3rd c. A.D. Health: Archaeological objects unveiling the ways hygiene was treated in antiquity ranging from athletics to personal hygiene. Objects depicting the ideal mode of life, related to personal hygiene as well as public health. Illness: Physical, mental as well as collective illnesses depicted in marble motive relieves and terracotta figurines. Treatment: Vases and marble reliefs depicting Homeric heroes and the treatment of their wounds. Healing deities, such as Asclepius hero-healers temples dedicated to Asclepius, known as Asklepieia.